When ever you blow air into you iPhone Mic what you hear? Nothing. Until unless you have opened any App. You might have used the App called Whistle, which requires you to blow air in the iPhone Mic and you can hear the noise of Whistle and then you can choose up to different sounds. What if you get an App by which you can blow one time and get different funny sounds and it at the same time you can compete with your friends also? So we got an App for that with the name of One Long Below, which requires only one long blow and in this one long below you hear many different and funny sounds which might make you laugh. Your mission is to give your iDevice a good hard blow for as long as possible in one single breath. Play against your friends and the world. Compare your rank in the Game Center leaderboard. Brag your achievements on Twitter and Facebook. Choose from many realistic blow sound effects. It’s time to prove how good you are at blowing. So did you blow today? 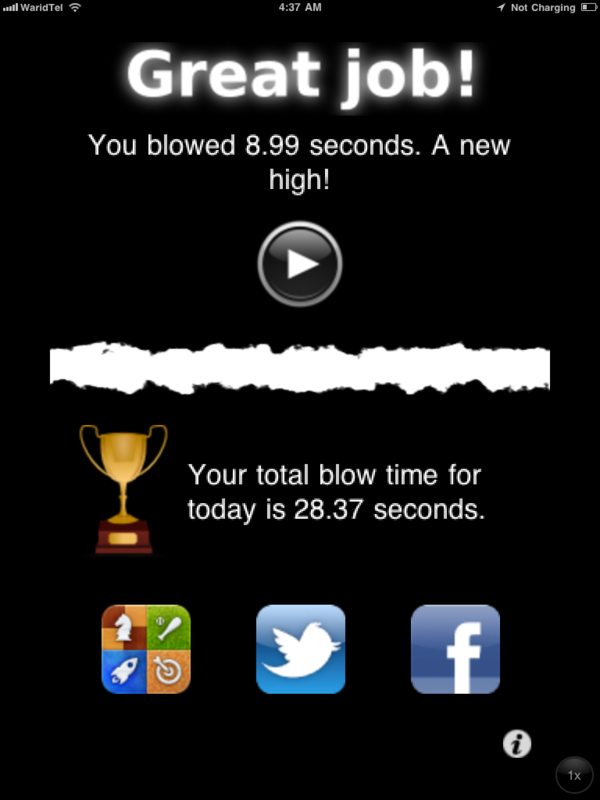 Well I blow for 8.99seconds. How much did you blow? This App is really amazing to kill time and compete your friends. You can share your score on Twitter, Facebook and on Game Center and let other people know that this is the maximum time you can blow. Any Known Issues With One Long Blow? This App doesn’t got any known issues so far. I have tested my self and others also have tested it. The only issue you will face will be of the Timer. While you are blowing the timer may stop. Why The Timer Will Stop while Using One Long Blow? Is That A Bug? The timer will stop only if their is a gap between you blowing. Like if you blow out slow or far from Mic, so it will stop. How To Fix One Long Below Timer? Blow long and hard into your microphone continuously. If there’s a gap or it’s too soft, the timer stops. So to continue you will have to blow long and hard. If you don’t follow the step your timer will stop. The App is made by XVisionNow. The App is Free for a limited in AppStore. So grab one copy for your self before it is late. You can Download the App from here.